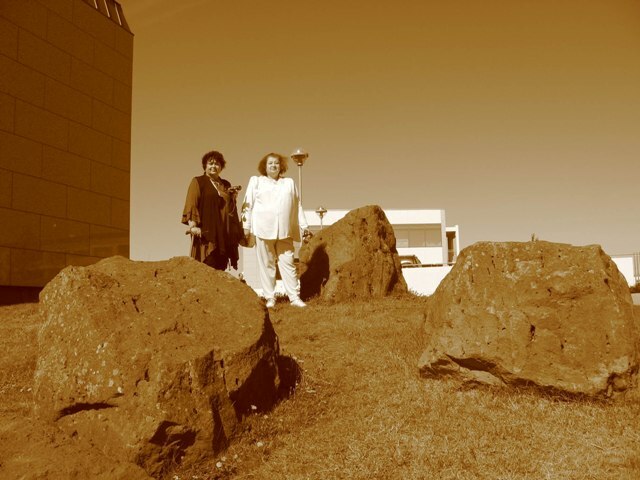 Three Russian ladies of the Institute of Universal Knowledge discovered ten megalithic sites on Iceland. One of these in Reykjavic consists of three huge boulders placed at the corners of a triangle. This monument tells three different stories. The first one deals with the discovery of the Northern Crossing of the Ocean by the 3rd king Nefererkare of the Fifth Dynasty of Egypt. The second one deals with the subsequent Biblical Flood at the start of the Sixth Dynasty, at which 2.6 million people perished (54% of the world population). The third one deals with the Dardanus Flood during the reign of the 2nd king Ramses III in the 20th Dynasty. It was caused by the same Comet: 3.8 million people died, and another 2.0 million people expired due to system collapse (32% of the world population). The monument was erected in Dynasty 23. Lidia Peretrutova, Elvira Babenko and Elena Alekseeva are members of the Institute of Universal Knowledge in Moscow, Russia, which was founded in 1989. They studied the megalithic monuments of Western Europe for about twenty years. In 2011 they visited Iceland, and discovered about ten different megalithic sites, both in the vicinity of Reykjavic and around Egilsstadir in the east. One of these sites is located at a distance of c.100 meters from the church of Kopavog (Kopavogskirkja) in Hamraborg near the capital of Reykjavik. Three huge boulders are placed at the corners of a triangle. Each of these boulders has a diameter of about one meter (Fig.1). The three huge boulders correspond to the Nile Delta of Egypt, at 30oN. The Northern Crossing of the Ocean was defined by the three landpoints of the Shetland Islands, the South Cape of Greenland, and Cape Chidley, Canada, at the complementary latitude of 90o - 30o = 60oN. In antiquity latitudes were already known after 4800 BC, and the use of complementary latitudes was very common. The three boulders consist of two southern stones close to each other, and a third one in the north, further away (see Fig.1). The two southern boulders symbolize the two southern Crossings of the Ocean, which were previously discovered by the 2nd king Sahura (c.2510-2498 BC) of the Fifth Dynasty. The capital of Reykjavic is located at 64oN. The complementary latitude of the site is 90o - 64o= 26oN, encoding the 2.6 million casualties of the Flood, which was caused by a Comet Catastrophe. The South Cape of Greenland, at 60oN, refers to Cape Brewster, Greenland, 6o above the site, at 64o + 6o = 70oN, in agreement with the 7 figures of this number (2.6 million). The islet of Rockall, at 57oN, is located 64o - 57o = 7o below the site, confirming it. The three boulders also correspond to the three island groups of the Azores, in the middle of the Ocean, at 38oN. Their average latitude is 64o - 38o = 26o below the site, confirming the 2.6 million victims. Reykjavic is located due north of the shortest sailing route to the Cape Verde Islands, which are situated on about the same meridian, at 16oN. The site is located 64o - 16o = 48o above these islands, encoding the original world population before the Flood of 4.8 million men. The Azores are located 38-16= 22° above these islands, encoding the number of survivors, 4.8-2.6= 2.2 million men. Most of them were seriously wounded. Note, that the “relative difference in latitudes” between Iceland and the Cape Verde Islands confirms the Disaster: (48/90)x4.8= 2.6 million victims. The three boulders confirm the rounded off number: c.3 million men. The percentage of victims was (2.6/4.8)x100= 54%. This number is symbolized by the west coast of Ireland, at 64o - 10o = 54oN, and by the monuments in the Boyne Valley at this latitude, 64o - 54o = 10o below the site as indicated by the ten Cape Verde islands. The Strait of Gibraltar is located at the complementary latitude of 90o - 54o = 36oN. It symbolizes the circumference of the planet Earth, 360o, or 36 Egyptian Moiras. It shows it was a worldwide Catastrophe! It ended all ancient civilizations on Earth, including the Old Kingdom. The Flood was caused by a Comet. In antiquity the Head of this Comet was symbolized by the island of Greenland, which consists of ice and stones. The Tail of the Comet was represented by the North Atlantic Ocean, which contains a huge amount of water. The three boulders of the site encode the important SW Cape of Greenland, 3o below the monument, at 64o -3o = 61oN. This latitude of 60o + 1o = 61oN shows it happened during the reign of the 1st king Teti (c.2370- 2338 BC) of the Sixth Dynasty of Egypt. This is correct, because it occurred in c.2344 BC (tree-ring dating). Reykjavic is located 64o - 32o = 32o above the island of Bermuda, confirming the 32 years of reign of this king. The latitude of Cape Farvel also corresponds to the periodicity of this dangerous Comet (or Comet Swarm), about 600 years. The three boulders as well as the Nile Delta, at 90o - 60o = 30oN, confirm the 3 figures of this number. The three boulders encode the more accurate periodicity of 600-30= 570 years, as indicated by the latitude of the islet of Rockall, at 57oN. The Azores are located 38o - 30o = 8o above the Nile Delta, encoding the total precipitation during the Flood of about 80 micromoiras= 80 x 0.11 = 8.8, or 9 meters of water (1 moira = 1 degree = 111 km). The three boulders appear to show the date of the site. It was the third time period of good government of Egypt, after the Old Kingdom and the Middle Kingdom. So the site appears to date from the New Kingdom. It consists of the 18th, 19th and 20th Dynasty. So, the three boulders appear to indicate a date in the 20th Dynasty. However, in that case the boulders may also tell the story of the Dardanus Flood, which happened during this dynasty. The three boulders definitely show this monument is dealing with three important stories (instead of two)! Fig.1 Megalithic Monument at Kopavogskirkja, Hamraborg, at Reykjavik on Iceland. It appears the three boulders were placed because of the Biblical Flood, which ended the Old Kingdom of Egypt (Dynasty 23, c.818-715 BC). (Courtesy Mrs. Elena Alekseeva of the Institute of Universal Knowledge, Moscow, Russia). The true periodicity of the Comet equals 575 years. So, the Comet was expected to return in the year of 2344-2x575= 1194 BC. It was the first year of government of queen Tausert (1194 -1186 BC), who acted as a regent for king Siptah (1194-1188 BC), the last heads of state of the 19th Dynasty. However, the Comet exploded near the Sun. A dangerous part of it reached the Earth 35 years later, in 1194-35= 1159 BC. The three boulders, 5 Moiras west of the Nile Delta, confirm these 30+5= 35 years. Reykjavic is located 64o - 29o = 35o above the Canary Islands, confirming it. Iceland was reached from the Orkney Islands by sailing 2 moiras to the Faroer, and another 2 moiras to its SE coast, at 64oN. Reykjavic is located 64o - 62o = 2o above the Faroer, all corresponding to the 20th Dynasty. It is located 64o - 44o = 20o above the north coast of Spain (and Sable Island), confirming it. The coast of Trondheim, Norway, at the latitude of Reykjavic is situated 2 Moiras, or 20o, west of the Nile Delta, confirming it, again. The three boulders consist of two stones close to each other, and a third one further away (see Fig.1). It represents the 2nd king Ramses III (1184-1153 BC). The Disaster happened at the end of his reign, in 1159 BC. Reykjavic is located 64o - 33o = 31o above the two islands of Madeira, confirming the 31 years of reign of this 2nd king. Reykjavic is located 64o - 60o = 4o above Cape Farvel, the south cape of Greenland, encoding the first time period of 40 days. The falling stones were causing horrible forest-fires, and the melting ice resulted in torrential rains and worldwide floodings. It was completely dark on Earth. The second time period lasted 40 days, too. The climate was completely disrupted. The terrible rains continued, but it also became very cold. So, the rains changed into ferocious snow and hail storms. – It resembled the Biblical Flood at the start of the Sixth Dynasty! The Azores are located 38o - 30o = 8o above the Nile Delta, confirming the total duration of 40 + 40= 80 days. The Central Azores consist of 5 islands, and Reykjavic is located 5 Moiras west of the Nile Delta, both encoding the precipitation during the Dardanus Flood, 50 micromoiras= 50x0.11= c.5.5 meters of water. - The consequences of the Comet Catastrophe lasted to the end of Dynasty 22, more than four centuries after the event. Reykjavic is located 4o above Cape Farvel, confirming these four centuries. The Azores are located at 38oN, encoding the 3.8 million casualties. The north coast of Schotland is located 20o higher, encoding the 2.0 million casualties because of system collapse (lack of government, wars). It is located at 38o + 20o = 58oN, corresponding with the total number of 5.8 million victims of the Dardanus Flood. The islet of Rockall, at 57oN, is situated 64o - 57o = 7o below the site, in agreement with the 7 figures of this number (5.8 million). Cape Farvel, the south cape of Greenland, is located at 60oN, confirming the total number of casualties, c.6 million men. The length of its meridian on the Northern Hemisphere equals 180o, encoding the original world population before the Catastrophe, 18 million men. The complementary ‘latitude’ of 180o - 60o = 120o corresponds to the number of survivors, 18-6= 12 million men. The Azores are located 38o - 30o = 8o above the Nile Delta, confirming the 8 figures of this number (12 million). The south point of the Gulf of Campeche, Mexico, is located at 18oN, confirming the original world population before the Flood, 18 million men. It is the center of the Realm of the Dead (the land of Punt), where the Olmec Culture started. Cape Gallinas, the north cape of South America is located at 12oN, corresponding to the number of survivors, 12 million men. The difference equals the number of casualties of the Dardanus Flood, 18-12= c.6 million men. The three boulders encode Cape Holm, Greenland, on the holy Arctic Circle, at 64o + 3o = 67oN. The center of the Southern Egyptian Empire is at the complementary latitude of 90o - 67o = 23oN. It is also the center of the Sun religion. It encodes the date of the megalithic monument on Iceland in Dynasty 23 (c.818-715 BC). The 3 boulders of the site at Reykjavic confirm it: 3 dynasties after the 20th Dynasty of the Dardanus Flood! 6. De Jonge, R.M., and Wakefield, J.S., “Discovery of the Islands in the Ocean (Cairn T, Loughcrew, Co. Meath, Ireland, c.3200 BC)” (2011), Ref.3, to be published. 7. De Jonge, R.M., and Wakefield, J.S., "The Passage Grave of Karleby, Encoding the Islands Discovered in the Ocean, c.2950 BC", Migration & Diffusion, Vol.5, No.18, pgs.64-74 (2004), Ref.5. 8. De Jonge, R.M., “The Discovery of Three Continents (Santo Stefano, North Sardinia, Italy, c.2300 BC)”, Ancient American, Vol.12, No.76, pgs.28-29 (2007), Ref.3. 9. De Jonge, R.M., “Houghton’s Petroglyph (Copper Country, Michigan, 2500-1200 BC)” (2009), Ref.3, to be published. 10. De Jonge, R.M., “The Mystic Symbol, mark of the Michigan Mound Builders” (2009), Ref.3, to be published. 11. De Jonge, R.M., “A Sword for America (Kirkburn, East Yorkshire, England, c.250 BC)” (2009), Ref.3, to be published. 12. De Jonge, R.M., “The Battersea Shield (River Thames, London, c.190 BC)” (2009), Ref.3, to be published. 13. De Jonge, R.M., “Anglo-Saxon Cemetery Artifacts (Sittingbourne, Kent, SE England, c.650 AD)” (2011), Refs.3,5, to be published. 14. De Jonge, R.M., “Tripod Rock, Pyramid Mountain (Morris County, New Jersey, c.1900 BC)” (2011), Refs.-3,5, to be published. 15. De Jonge, R.M., “Stonehenge, Monument for the Discovery of America (Salisbury Plain, South England, c.2000 BC) (2011), Refs.3,5, to be published. 16. Peiser, B.J., Palmer, T., Bailey, M.E., Natural Catastrophes during Bronze Age Civilizations, BAR International Series 728, Oxford, 1998 (ISBN 0-86054-916- X). 17. Baillie, M.G.L., “Hints that Cometary Debris played some Role in several Tree-Ring Dated Environmental Downturns in the Bronze Age”, Ref.16, pgs.109-117. 18. Peiser, B.J., “Evidence for a Global Disaster in the Late 3rd Millennium BC”, Ref.16, pgs.117-140. 19. Courty, M.-A., “The Soil Record of an Exceptional Event at 4000 BP in the Middle East”, Ref.16, pgs.93-109. 23. Baillie, M., Exodus to Arthur, Catastrophic Encounters with Comets, BT Batsford Ltd., London, 1999 (ISBN 0-7134-8681-3). 26. De Jonge, R.M., “Discovery of America and the Flood (c.2300 BC, Ita Letra, Villarrica, Paraguay)” (2009), Ref.3, to be published. 27. De Jonge, R.M., “The Discovery of Australia and the Flood (The Rainbow Serpent Shelter, Mt. Borradaile, Arnhem Land)” (2010), Ref.3, to be published. 28. De Jonge, R.M., "The Ikom Monoliths and the Flood (1200 BC-200 AD, Cross River State, Nigeria)" (2010), Ref.3, to be published. 29. De Jonge, R.M., “Great Serpent Mound (c.2300 BC, Adams County, Ohio)” (2010), Ref.3, to be published. 30. De Jonge, R.M., “Gold Ring (Grand Canyon, Arizona, c.1450 BC) (2010), Ref.3, to be published. 31. De Jonge, R.M., “The Swan Stone (Burrows Cave, near Olney, Illinois)” (2011), Ref.3 , to be published. 32. De Jonge, R.M., “Sentinel Rock, Vermont (Discovery of America and Biblical Flood, c.1900 BC)” (2011), Refs.3,5, to be published. 33. De Jonge, R.M., “The Brandenburg Stone, Comet Catastrophe of 536/540 AD” (560 AD, Battletown, Meade County, Kentucky) (2010), Ref.3, to be published. 34. De Jonge, R.M., “Four Ancient Stories (Poverty Point, NE Louisiana, c.700 BC)” (2009), Ref.3, to be published. 35. De Jonge, R.M., “The Myths of Monks Mound (Cahokia, Illinois, 650-1400 AD)” (2010), Ref.3, to be published. 36. De Jonge, R.M., “Ikom and the Dardanus Flood (c.1159 BC, Cross River State, Nigeria)” (2010), Ref.3, to be published. 37. De Jonge, R.M., “Peters Creek Mound (c.715 BC, Clairton, Pennsylvania)” (2010), Ref.3, to be published. 38. Susan English, Website of the Ancient Waterways Society.